G.O.O.D. Music is in building. 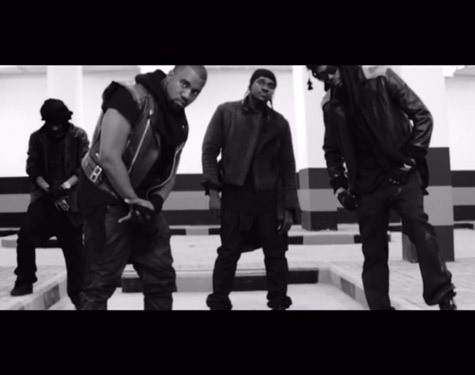 Kanye West drops the top on the video for “Mercy” featuring Big Sean, Pusha T, and 2 Chainz, the first single off the upcoming Cruel Summer compilation. The slick, yet simplistic black-and-white clip was filmed in an underground parking garage, with each member of G.O.O.D. Music color coordinated in black. With a Lamborghini Murciélago in the background, the four rappers mean mug for the camera, with cameos from the rest of the family including Kid Cudi and Teyana Taylor. Swerve! This entry was posted in Music Videos and tagged 2 Chainz, Big Sean, Family, G.O.O.D music, Kanye West, Kid Cudi, mercy, PUSHA T, Squad, Swerve, Team, Teyana Taylor. Bookmark the permalink.